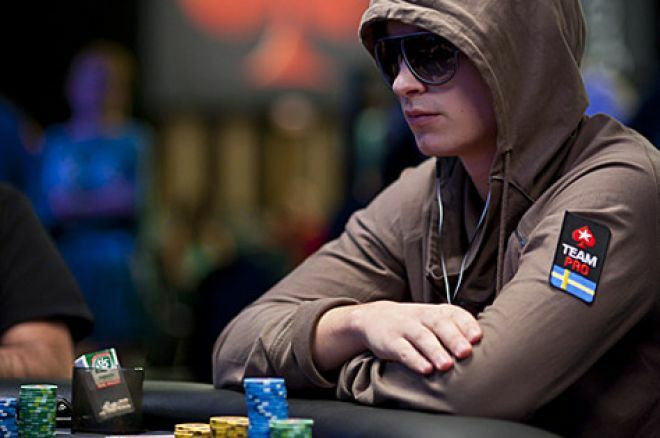 So far, the 2012 Spring Championship of Online Poker (SCOOP) at PokerStars has been the Viktor "Isildur1" Blom show. He followed up his win on Day 2 with another victory on Day 3, and if he didn't have your attention before, he sure has it now. Day 3 also saw several other big names get very close to capturing SCOOP first-place finishes. Daniel "KidPoker" Negreanu and Scott "gunning4you" Seiver each finished runner-up, and Bertrand "ElkY" Grospellier added a third-place finish to his SCOOP résumé. Only 46 players remained at the start of Day 2, with "johnxfleming," "Sussie Smith," and Viktor "Isildur1" Blom sitting in the top three spots, and many other notables still in contention. Over the next hour, Blom surged to become the first player to 1 million — around 280 BBs at the time. Meanwhile, others to fall included Steve "Illini213" Barshak (20th - $6,000), Ronny "1-ronny3" Kaiser (19th - $6,000), Eddy "eddymaksoud" Maksoud (17th - $7,600), George "Jorj95" Lind (16th - $7,600), and Giuseppe "Ansgar2000" Pantaleo (14th - $7,600) — the latter wiped out after running into Blom's pocket aces. When Dani "supernova9" Stern hit the rail in 13th ($7,600), they were down to two six-handed tables, and Blom was still on top with more than 1.23 million. It took about an hour for the next six eliminations to come, during which time Blom increased his lead further. The six to fall one table shy of the final were "ed.royalbh" (12th), "wintyara" (11th), and "vovtroy" (10th), each earning $11,200, and "huiiiiiiiiii" (9th), "Soccermom96" (8th), and "johnxfleming" (7th) who took away $17,600 apiece. Blom continued his charge shortly after the final table began, swiftly grabbing a big pot from Alexandre “BiatchPeople” Luneau after checking down second pair of kings on the river to push up over 1.83 million. But Luneau battled back against Blom, managing to take back chips and eventually move into the lead. A short while later, Blom was opening with a min-raise to 15,000 from the button when Clark "snake8484" Hamagami pushed his stack of 130,348 all in from the small blind and Blom quickly called. Hamagami had and Blom showed . The flop came to pair Hamagami, but Blom had a flush draw to go with his overcards. The turn was the , but the river brought the , giving Blom the flush and sending Hamagami out in sixth. A little later, "B4d3m3!st3r" and Iulian-Georgian "Ruxandescu" Ruxandescu put in a series of preflop raises, culminating with a seven-bet shove by Ruxandescu and a call by "B4d3m3!st3r" to put his stack of nearly 550,000 — a little under 70 BBs — at risk. "B4d3m3!st3r" had , but Ruxandescu's raises had meant what they appeared to — he held . The board ran out nine-high with just two diamonds, and "B4d3m3!st3r" was eliminated in fifth. About a half-hour after that the blinds were 4,500/9,000 when "Sussie Smith" opened with a min-raise from UTG, and both Luneau (SB) and Blom (BB) called. The flop came , and Luneau led for 38,000. Blom made it 96,500, then "Sussie Smith" reraised to 180,000. Luneau stepped aside, but Blom fired back with an all-in shove and "Sussie Smith" called with the 422,093 left behind. Blom had for two pair while "Sussie Smith" was on an open-ender with . The turn was the and river the , and they were down to three. Blom and Luneau battled for the lead over the next half hour. Then Blom took a hit when Ruxandescu claimed a 1.2 million-plus chip pot in a hand in which both had two pair, but Ruxandescu had the better kicker. Blom then stayed in last for a while, but managed to score a double-up through Luneau to retake the lead in a hand in which Blom rivered a second pair and got his all-in push called. Then came a hand in which Luneau called a three-bet from Ruxandescu and the pair saw a flop come . Ruxandescu bet 104,000 (about two-thirds pot) and Luneau called, then Ruxandescu check-called Luneau's bet of 224,000 following the turn. The river brought the and Ruxandescu checked again, prompting Luneau to fire all in for his last 719,294. Ruxandescu quickly called, showing for queens full, and Luneau showed his losing before hitting the rail in third. Heads-up play began with Ruxandescu in front with just over 3.16 million to Blom's 2.38 million. Ruxandescu remained ahead for the first stage of their battle, eventually chipping Blom down to below 1 million. Blom then managed a fortunate double-up after shoving with on a board versus Ruxandescu's pocket queens and catching a four on the turn to make two pair. Blom would draw close to even shortly after that in a hand in which he committed with top pair on an eight-high flop versus Ruxandescu's nut flush draw and saw his hand hold. As they crossed the half-hour mark of their duel, Blom took the lead in a hand in which he rivered a flush and got value from a Ruxandescu check-call. Blom would continue to apply pressure, building up close to 4 million while Ruxandescu fell under 1.58 million. Then, with the blinds 11,000/22,000, Blom min-raised from the button, Ruxandescu three-bet to 132,000, and Blom called. The flop came and Ruxandescu continued for 165,000. Blom made it 464,750, Ruxandescu shoved, and Blom called, showing for middle pair and a gutshot. Meanwhile, Ruxandescu had for a flush draw and a gut shot of his own. The turn was the and river the , meaning Blom's full house bettered the straight Ruxandescu had drawn to give Blom his second SCOOP title in two days! The "medium" version of Event #3 saw 57 players survive the first day of play. Among those getting to Day 2 yet coming up short of the final table were Casey "bigdogpckt5s" Jarzabek (54th - $1,095.10), Bertrand "ElkY" Grospellier (53rd - $1,095,10), Hugh "Jackovich" Cohen (50th - $1,095.10), Rupert "ElRupert" Elder (31st - $1,655.38), Adam "Roothlus" Levy (25th - $2,037.40), and Ana Marquez (18th - $3,361.71). Ultimately, "FlashYy" took down the full first prize after heads-up deal talks with eventual runner-up "Mihay28" fell through. After Monday's wild Day 1, only 93 players came back for more on Tuesday in Event #3-L, and after about four hours of play, they'd worked their way down to the final six. Among those cashing were Alex "J0hnny_Dr@m@" Zervios — first one out on Tuesday in 93rd ($248.33) and Danny "THE__D__RY" Ryan in 21st ($1,083). "Respect4life" enjoyed a big chip lead to start the final table, with Leandro "leopeluca" Csome among the remaining challengers in fourth place. Csome ultimately came up short, finishing fifth. Meanwhile, "Respect4life" maintained the lead for most of the final table, only losing it for a short while to "Pr0fiteer" before outlasting "/7aXaH-777" following a heads-up deal. Back on track, Negreanu found himself swiftly out of both the "Low" and "Medium" five-card draw tourneys, but things went differently in the "High." Amid a tough, intimate field of 84, Negreanu gradually accumulated chips to be among the leaders with 20 players left, in third behind Chris "ImDaNuts" Oliver and "Gagarin007." Also still in the hunt at that point were Negreanu's fellow Team PokerStars Pros Eugene Katchalov, Johnny Lodden, and Bertrand "ElkY" Grospellier, although they each were sitting with below-average stacks. Only the top 12 finishers made the cash, meaning the next few to fall would fail in that effort, including Katchalov (19th), Lodden (18th), and Calvin "cal42688" Anderson (17th). Scott "gunning4you" Seiver would be the next to go in 16th, followed by "playitsafe" (15th), Andrey "Kroko-dill" Zaichenko (14th), and money bubble boy "ranayr" (13th). Once in the money, Negreanu had pushed out into the lead with nearly 70,000, with Jonathan "Iftarii" Jaffe close behind in second and Bertrand "ElkY" Grospellier lurking in the middle of the pack. He stayed in front as Oliver (12th), "dejanaceking" (11th), and "Nedifen" (10th) all were felted, each earning min-cashes of $2,100. Kyle "KJulius10" Julius (9th) and Anthony "wwwBTHEREcom" Gregg (8th) followed, each taking away $3,150. Meanwhile, Grospellier began to grab pots and push past everyone, nearing 100,000 as he claimed the top spot. Then "TripleMerge" fell in seventh ($3,150) when Jaffe used two pair to beat his pair of eights, and the final table was set. About 15 minutes into the final table, Jaffe became the short stack with just over 22,000. Then with the blinds 700/1,400, Grospellier opened with a min-raise, "Metalguru84" reraised to 6,300, then it folded back to Jaffe in the blinds who shoved all in, getting a fold from Grospellier, but "Metalguru84" called. Jaffe drew two while "Metalguru84" stood pat, then Jaffe showed a strong hand — for trip aces. But "Metalguru84" tabled for a pat straight, and they were down to five. From there, Grospellier began building his stack and lead while Negreanu slipped back into fifth position of five. Negreanu would hang on, however, while both "Gagarin007" and "Metalguru84" saw their stacks start to slide. Then with the blinds 1,000/2,000, "Maestro Shao" opened for 4,400 from UTG, then "Metalguru84" pushed all in for his last 19,914. "Gagarin007" called the raise, then everyone else folded, including "Maestro Shao." Both players discarded one, then "Metalguru84" showed for kings and tens. Alas, he was beat, as "Gagarin007" had for a better two pair, and "Metalguru84" was out in fifth. A while later, "Gagarin007" had become short again and when Negreanu opened with a min-raise to 4,000 from UTG, "Gagarin007" reraise-shoved for 24,948, getting a call from Negreanu. Both took three cards, then Negreanu showed . His pair was good enough, as "Gagarin007" had but , and just three remained. They made it to the 12-hour break, at which point "Maestro Shao" had the big lead over the two Team PokerStars Pros with almost 250,000 to Negreanu's 98,567 and Grospellier's 72,936. About 20 minutes later, the blinds were 1,250/2,500 when "Maestro Shao" opened for 5,500 from the small blind, then Grospellier reraised all in for 110,561 from the BB, getting a call from his opponent. "Maestro Shao" took two cards while Grospellier took just one, then Grospellier showed for two pair, but it wasn't enough against "Maestro Shao's" . Negreanu fought back after the break, eventually taking the lead, but got knocked back down after a hand in which "Maestro Shao" ended up all in before the draw and took two cards to Negreanu's one. "Maestro Shao" ended showing trip fours versus Negreanu's aces and tens, and suddenly Negreanu was back down under 80,000. Ten minutes later it was Negreanu pushing all in over a "Maestro Shao" min-raise and his opponent called. Negreanu discarded three and Maestro Shao two. Negreanu showed for nines, behind "Maestro Shao's" , and after nearly 14 hours the tournament had a winner. The "Medium" five-card draw event attracted another large field, and among the 78 who cashed were Bryn Kenney (16th - $568.23), former WCOOP winner "nilsef" (35th - $317.72), and the memorably named, former SCOOP winner "RectalRash" (52nd - $219.96). Meanwhile, "Maestro Shao" nearly matched his #6-H run, making another final table in this one, though ultimately fell in sixth. Ultimately a three-way deal was made, with "trinec" eventually grabbing the title. The "low" version of the no-limit five-card draw event saw PokerStars Team Online member Anders "Donald" Berg make yet another deep run in a SCOOP event, finishing in seventh to just miss out on the final table, earning $521.71 for his $11 buy-in. "SLAH 97" came to the final table as the leader, but in the end it was the aptly-named "Born2Ca$h" who claimed the title and SCOOP watch. The first of three heads-up events to run during SCOOP was yesterday and several big names made deep runs in the high buy-in. Among them were Joep "Pappe_Ruk" van den Bijgaart (5th - $14,239.10), Justin "ZeeJustin" Bonomo (8th - 14,239.10), Chris "Moorman1" Moorman (10th - $7,661.49), Victor Ramdin (14th - $7,661.49), Jason "jakoon1985" Koon (19th - $4,011.39), Ami "UhhMee" Barer (24th - $4,011.39), Iulian-Georgian "Ruxandescu" Ruxandescu (31st - $4,011.39), Tim "Tmay420" West (35th - $2,433.39), and Fabrice "fabsoul" Soulier (37th - $2,433.39). Scott "gunning4you" Seiver defeats "TRiggA_miK3"
Seiver made quick work of "TRiggA_miK3," getting the job done in about 22 minutes and in the second level of play. With about a 3:1 chip lead at 30/60, Seiver opened to 150 on the button. "TRiggA_miK3" popped it to 360 from the big blind, only to see Seiver four-bet jam. "TRiggA_miK3" called all in for 2,680 with and was in good shape to double against Seiver's . The board ran out as Seiver paired his ace to reserve a seat in the championship match. It took until Level 3, 40/80, for Seiver's opponent to be determined, making the final four a relatively quick affair. At nearly a 9:1 chip disadvantage, "JRADF79" shoved for 1,290 on the button with and was met with a call from "shurgar" with . The board ran out , sending "shurgar" through to the finals. Sixteen hands were all it took in what was a very bizarre championship match. Down about 2:1 in the match at 25/50, Seiver put in a three-bet to 350 after "shurgar" min-raised the button. The next move from "shurgar" was all in, putting the Seiver to the test. However, Seiver's Internet connection went down and his time bank of about six minutes ticked all the way down to zero. Another four minutes passed as the tournament clock was paused, waiting for Seiver to re-connect. When that four minutes passed, Seiver's hand was folded. He came back as the next hand was being dealt, and, of course, it provided fireworks. Seiver opened to 125 on the button and "shurgar" called to see an flop. A check from "shurgar" followed by a Seiver bet of 135 led to check-raise to 320 by "shurgar." Seiver called and when the hit the turn, "shurgar" bet 550. With , Seiver went all in with his flush for 2,580. A call from "shurgar" with revealed trips with outs to a better flush. The slammed down on the river, giving "shurgar" a full house to take down the tournament. The guarantee for medium portion of Event #7 was not doubled, not tripled, but near quadrupled. Among those making deep runs were Faraz "The-Toilet 0" Jaka (15th - $2,957.78), Dani "supernova9" Stern (21st - $1,546.65), Rasmus "bigoots" Sibast (25th - $1,546.65), Billy "b8chatz" Chattaway (26th - $1,546.65), Elio "smokrokflock" Fox (33rd - $936.82), Calvin "cal42688" Anderson (52nd - $936.82), and Andrey "ThePateychuk" Pateychuk (57th - $936.82). Coming away with the outright win was "jotothejo" for more than $31,000. A massive field of 16,834 took to the virtual felt for the low running of the Event #7 and only one person emerged with an undefeated record. "HustlaStylez" emerged victorious for nearly $8,400. Among the many notables remaining in the field are Rupert "ElRupert" Elder (12th), Eugene Katchalov (19th), Jonathan "MONSTER_DONG" Karamalikis (44th), Phil "USCphildo" Collins (65th), Jon "TherookieQQ9" Plens (69th), Matt "ADZ124" Marafioti (91st), Lauren "locoencabeza" Kling (107th), Bryn "BrynKenney" Kenney (117th), Steve "gboro780" Gross (123rd), and Tom "kingsofcards" Marchese (135th). Out of the 5,842 entrants that participated in the medium running of Event 8, 185 will return on Wednesday to seek out the $91,388.80 for the winner. Still in the hunt are Taylor "tRaMp$d0PrAy" Paur (11th), Patrick "pmahoney22" Mahoney (12th), Lex Veldhuis (20th), Shaun "shaundeeb" Deeb (23rd), and Benny "toweliestar" Spindler (33rd).